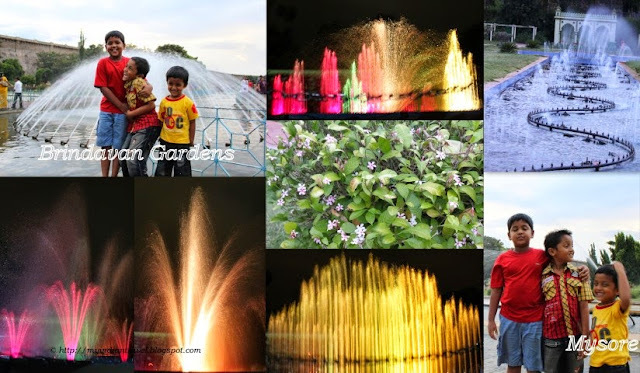 The Brindavan Gardens is a garden located just 19kms from the heart of Mysore. The garden occupies an area of 60 acres. The garden is maintained by the Cauvery Niravari Nigama, a Government of Karnataka enterprise. The garden is open to general public and a nominal entry-fee is charged. The work on laying out this garden was started in the year 1927 and completed in 1932. The garden is laid out in 3 terraces which contain water fountains, Ficus trees, foliage plants such as Duranta plumaria and Euphorbia and flowering plants like Celosia, Marigold and bougainvillea. There is also a lake within the garden with boating facilities available for visitors. The visitors can enjoy a boat ride around the famous statue of Goddess Kaveri. It is a mesmerizing sight when the whole garden is lit up in the evenings. This beautiful gardens are laid out below the Krishnaraja Sagar dam built across the river Cauvery. The main attraction of the park is the musical fountain in which bursts of water are synchronized to the music of songs after sunset. What a lovely garden. You have a beautiful family. I wish you all the best in 2016, Happy New Year! Beautiful! I love those fountains set to music. Fabulous garden fountains....so beautifully laid out! Such a beautiful garden with remarkably colorful fountains. Quite an attraction! Wonderful garden and a very interesting city with such old tradition, as I could read in a previous post! Wonderful aspects and it must be so lovely to see the play of lights, color and water fountain! Have a great start in week and many greetings! Beautiful, colorful captures, Rajesh!! I hope you're enjoying the Season!! Wishing you a great new year!! Looks like everybody had a nice time ! What a beautiful place and an amazing fountain. I know I'd enjoy visiting this beautiful garden, Rajesh! Both in daytime and nighttime hours it must be a wonderful sight to see. I love the night scene and also your mosaic! Such pretty gardens. I love the lights! The musical fountains look rather impressive! Hope you had a happy christmas time! Love the wonderful night shots ~ beautiful! Beautiful elegant formal gardens. I bet the boys loved that boat ride! ( I would too!). Happy New Year ! WOW !!!!!! lovely shots, the place is so beautiful. Its really a beautiful place and a main attraction when you are in Mysore . Pictures are very attractive.